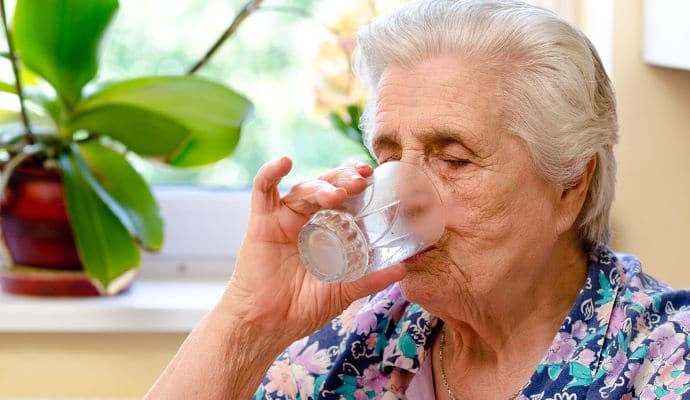 Difficulty swallowing food or liquids is a serious problem for seniors. This is often caused by a condition called dysphagia, which could cause malnutrition, dehydration, or aspiration pneumonia. It’s estimated that this condition affects 15% of seniors and up to 68% of nursing home residents. To keep your older adult safe and healthy, Vive Health shares 7 expert tips on managing dysphagia. Dysphagia, or difficulty with swallowing, affects an estimated 6 million seniors in the United States. Dysphagia (pronounced dis-fay-gee-ah) typically results from the weakening of mouth and throat muscles. It can be caused by aging, diseases like multiple sclerosis (MS), cancer, or Alzheimer’s, or from a medical trauma like a stroke. A dysphagia diagnosis is typically evaluated through a swallow test administered by a speech pathologist. In this type of test, your older adult will swallow a contrast solution (made of barium) and then be continually x-rayed while swallowing liquids of different consistencies – water (thin), nectar thick, honey thick, and pudding (spoon) thick. If additional tests are needed, they may include a visual examination of your older adult’s esophagus, an endoscopic swallowing evaluation, an esophageal muscle test, or further imaging scans. The x-ray swallow test is looking for aspiration, where liquid is swallowed and goes down into the lungs instead of the stomach. Aspiration typically causes pneumonia or other serious conditions. If aspiration is happening, doctors will make recommendations for managing dysphagia with a diet consisting of thickened liquids and pureed foods. When it comes to caring for someone with dysphagia, there are 7 key things for caregivers to keep in mind. If your older adult used to take oral medications with water, they’ll now need to swallow them with a thickened beverage. Or, the pills will need to be crushed up and mixed in with a thicker food like pudding or applesauce. Pills typically taste pretty disgusting, especially when they have coatings on them. Using chocolate or vanilla pudding, applesauce, or something else sweet to mask the bad flavors is always a good idea. Important: Some pills are labeled as ‘not to be crushed,’ so always talk with the pharmacist about the medications your older adult is taking, if their pills can be crushed, and if you should avoid mixing them with anything specific. An ‘oral suspension’ (liquid version) of your older adult’s medicine may be a better alternative since it can be easily thickened. Depending on your older adult’s condition, a speech pathologist may explain to you that it’s generally not a good idea for dysphagia patients to use straws. For someone who has trouble drinking, using a straw may seem like a helpful aid, but straws are more likely to increase flow rate of liquids in the mouth. That gives weakened muscles a harder time getting the liquid down ‘the right pipe’ – which may lead to choking. Healthy hydration is key for anyone providing care for an older adult. With a dysphagia diagnosis, all water and drinks must be thickened. Drinking thickened liquids takes longer than drinking non-thickened ones, so managing healthy hydration requires patience and even keener attention from you. Thickening agents may come as gels or powders that are mixed in with a beverage – typically found in drugstores or online. Ice cream and jello seem like staple desserts for older adults, but when it comes to preventing aspiration with a dysphagia diet, they are out! Why? Both ice cream and jello can melt in the mouth and turn to a thin liquid which when swallowed, may cause aspiration. For people with dysphagia, it physically takes their tongue and jaw longer to get foods to the back of the throat for swallowing, leaving more time for things like ice cream and jello to melt into a dangerously thin liquid. For many dysphagia patients, getting enough calories as well as vitamins and minerals becomes a tough challenge. Drinks like Ensure and Boost may seem like good ideas to replace meals and add calories, but they’re often difficult to properly thicken because of the protein and vitamins in the liquid. Plus, they’re loaded with sugar and artificial ingredients. High fat foods like greek yogurt, avocado, peanut butter, coconut cream, and soft cheeses can be added to sweet and savory dishes to increase the calorie content and help older adults maintain weight. Easily pureed foods like winter squash, beans (cannellini, black, refried, etc), steamed vegetables (cauliflower, broccoli, kale, spinach, etc), and fruits (banana, strawberries, mango, etc) add loads of vital nutrients to your older adult’s diet and can be incorporated into thickened soups and purees. Ice cream and heavy creams can be blended with other ingredients into thickened consistencies that are suitable for someone with dysphagia. Milk can be blended with foods like banana, squash, and peanut butter to naturally thicken into shakes without artificial additives. Some nutritionists may recommend adding protein powders or therapeutic drink mixes (like Juven) to your older adult’s diet to help them maintain weight, especially for seniors who are building muscle. It is critical for dysphagia patients to sit completely upright when eating and drinking. This helps food and drink go down most successfully. If your older adult is in a hospital bed, wheelchair, or spends time in a recliner, you may need to adjust their back or help them hold their head up when eating and drinking. For people with dysphagia symptoms that accompany chronic illnesses like MS or Parkinson’s, extreme fatigue and weakness can make eating for more than 15 minutes at a time simply exhausting. The more tired your older adult is, the harder time they will have swallowing food and drink correctly. A speech pathologist may recommend that they eat and drink for short amounts of time spread out throughout the day. A dysphagia diagnosis takes caregiving to the next level, especially if you’re managing care for an aging parent or older adult who already has other chronic conditions. Speak with your older adult’s doctor right away if you are worried about any trouble swallowing or if you notice any dysphagia symptoms. Helpful tests and consultations with speech pathologists and nutritionists as well as the 7 tips above will give you the tools you need to keep your older adult as healthy as possible. The post 7 Helpful Tips for Seniors and Caregivers Managing Dysphagia appeared first on DailyCaring.